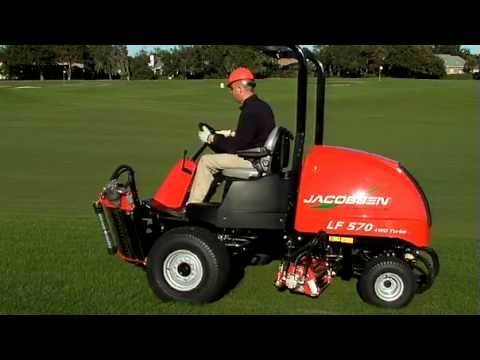 Building on the legend of the Jacobsen Light Fairway series, the LF570™ offers greater functionality through programmable controls, increased performance and simplified maintenance. The mower is one of the most productive and cost-effective mowers on the market. •Exclusive electronic hydro control with programmable speed controls to set mow and transport speeds quickly and easily. •Settings are passcode-protected, leaving operator input out of the equation. •Ergonomically design armrest with one-touch joystick control, LCD display, storage bin and 12V power outlet. •Full-text diagnostics are displayed on armrest LCD screen. No additional tools are required to diagnose. •Exclusive automatic wet parking brakes apply when the accelerator pedal is in neutral or the engine is idle or turned off. •Brakes are maintenance-free. There are no linkages, cables or pads to maintain or adjust. LF570: Five 7 in. diameter x 22 in.